No matter how careful you might be or how much you stress safety, workplace injuries are bound to happen. Northwest Ohio Urgent Care is here to serve all your occupational health and occupational medicine needs. 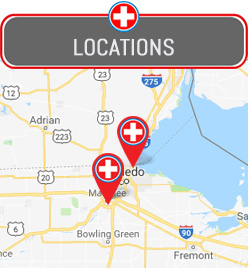 Our urgent care facility is a fantastic resource for the employees and employers of Maumee, Ohio. We offer a variety of employer services that are cost and time effective. Avoid waiting days for a primary care physician to be available or the long hours and high costs of an emergency room. Our walk in medical clinic can fill these needs with on demand treatment and services. As an employer, you must ensure the safety and productivity of your business by making sure your current and potential employees are physically fit for work. We can conduct thorough, but quick pre-employment physicals at our state of the art facility. Instead of waiting days for results, get immediate answers so you can move forward with your hiring process. Send current employees to our walk-in clinic for yearly physical exams or any drug testing needs. We will forward all results to you as well to your employee’s regular doctor to keep them up to date. Has an employee suffered an injury on the job? We’ll create a back to work plan to safely get them back on their feet and working for you again. Regardless of the size of your business, call us today and set up an account with us to further facilitate your employee’s visit with us. Our experienced staff are here to help you with all occupational health and occupational medicine needs. Employees choose Northwest Ohio Urgent Care as their regular urgent care facility for medical needs outside the workplace. If you are attempting to secure a Commercial Drivers’ License or CDL, our state certified physicians can conduct a DOT Physical for you. Our state of the art lab is onsite, which means we do not need to send away for the results of any bloodwork or drug testing. We can conduct that physical and any other pre-employment physicals in one visit. We accept most major insurances and you will find these costs are much lower than traditional emergency rooms. If you have no insurance, we have self-pay options available for you. Call us at 419-333-8031.